One of David Bowie’s early masterpieces, ‘Life On Mars?’ first appeared on 1971’s Hunky Dory album. Its enigmatic lyrics, soaring melodies and Mick Ronson’s masterful string arrangement all combined to make a modern classic, which remained part of Bowie’s live set until his final shows. There is a quick single repeat on the entire drum kit throughout the song. The ending? Ah yes, that strange ending with the piano coming back in and strange goings on as it fades out. Unfortunately that’s way too long a story to put in here! While touring in 1990, Bowie introduced the song with the words: “You fall in love, you write a love song. This is a love song.” There has been considerable speculation that “the girl with the mousey hair” was Bowie’s former girlfriend Hermione Farthingale, although she denied being his source of inspiration. I don’t actually have mousey hair. I wasn’t a person who lived at home with my parents, and I didn’t live a fantasy life in films. Nothing about me fits into any of the words. It is more likely that the words, like so many by Bowie, were intended to be impressionistic rather than literal. The parade of people and places – fighting sailors and lawmen, Mickey Mouse, hordes of mice, Ibiza, Norfolk, America, Britannia – juxtapose the everyday with fantasy in the mind of the young girl who dreams of glamour and escape. He said it was about a young girl’s view of the modern world and how confusing it was. In the song she’s watching a film and unable to relate to either reality or the film. The film tells her there’s a better life somewhere – but she doesn’t have access to it. The lines “Now the workers have struck for fame/’Cause Lennon’s on sale again” are a play on communism (the workers) and capitalism (Lennon). The song was written in the year John Lennon’s Imagine was released – the former Beatle’s commercial peak, in which he asked listeners to “Imagine no possessions”. 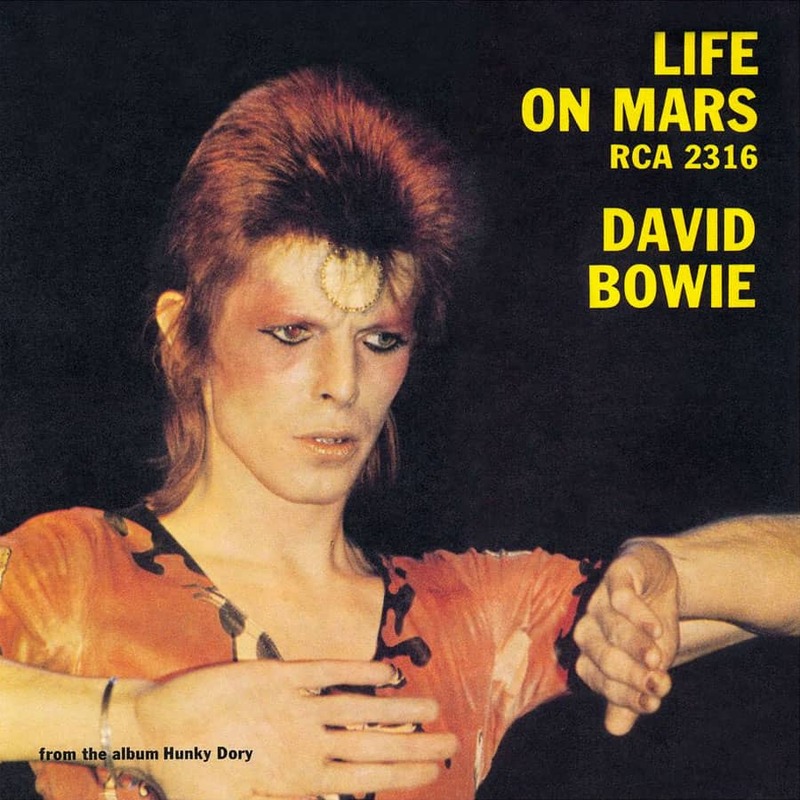 By coincidence, in 1975 Bowie and Lennon recorded ‘Fame’, the title of which also appeared in the ‘Life On Mars?’ couplet.